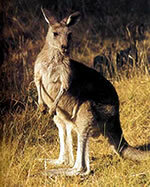 The Tasmanian forester kangaroo is a subspecies of the Eastern gray kangaroo found only in Tasmania. Adults grow to be the largest of all Tasmanian marsupials, reaching over 6.5 feet in height and weighing over 130 lb. Their coat color varies from light brownish gray to a full gray. Eastern gray kangaroos have long tails that are used for balance and as a prop when standing. They are very powerful jumpers and can jump 30 feet in a single bound. When not jumping, they move on all four limbs. The front limbs are much smaller than the hind legs and have five fingers for grasping objects. Tasmanian forester kangaroos have an excellent sense of smell, sight, and hearing, and can swivel their ears around to focus on a specific direction. Tasmanian forester kangaroos prefer to live on grasslands or in open woodlands. They are herbivores and eat mostly shrubs, leaves, grass and herbs. They are social and prefer to live in small groups called "mobs." The mobs include one dominant male, two to three females, two to three young males, and young kangaroos. Males are aggressive when it comes to establishing dominance. They use many types of aggressive behavior, including a form of "boxing," to gain dominance over the mobs. The winner is the one most likely to mate with the females in mob. Females give birth to one baby kangaroo or "joey" after a gestation period of 35 days. The joey remains in the mother's pouch for about 300 days. 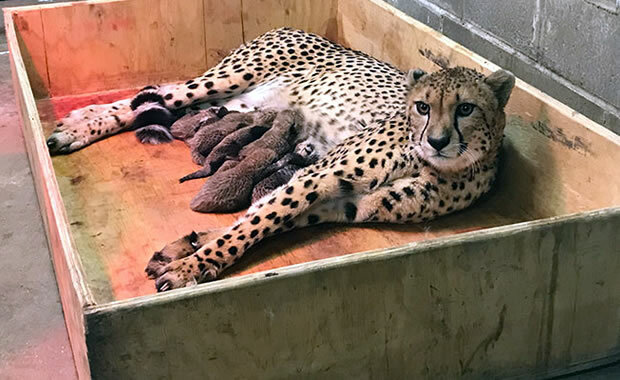 Joey's will usually nurse for about 18 months after they leave the pouch. Tasmanian forester kangaroo populations have reduced by about 90% since the 1800s due to hunting for its meat and the loss and fragmentation of habitat due to clearing of land for agricultural expansion. Currently, they compete with other introduced herbivores and livestock. And disease, road deaths, climate change, and poisonous baiting also pose a threat to their survival. The species is protected by law by the Australian government and most of their range is now on private property, enabling the population to grow. Glenn, C. R. 2006. "Earth's Endangered Creatures - Tasmanian Forester Kangaroo Facts" (Online). Accessed 4/24/2019 at http://earthsendangered.com/profile.asp?sp=220&ID=4. Need more Tasmanian Forester Kangaroo facts?